This game was addictive when I was a kid as it is now! No wonder this little monkey boy has the top slot in the top 100. For an early game they really put a lot into this one. Unfortunately Mr. Kidd's other games never managed to carry the flame this one had. A game like this was really unique to begin with and it's hard to improve on a classic! 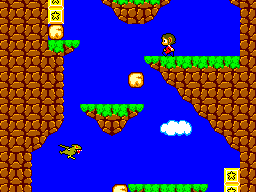 As platform games go this one is a classic. You got your running, jumping, swimming, you know all the basics. They also manage to toss in some cool vehicles and other items you can buy with money you collect. One of the real unique things about this game is most of the boss battles are Janken battles! Here you are smashing rocks with your fists and your reduced to rock/paper/scissors! Nothing amazing though the game is colourful and glitch free. Another game that shows how strong the graphics card is compared to a NES game. They did a good job putting a lot into the game well still making it quite look like they wanted it to. The Boss Janken guys all have heads in the shape of hands in one of the three forms, and they made them actually look like hands, though they don't move to much other then his arm. Nothing super though the music does get caught in your head if you play if too much. All the music is your classic simple background tune with maybe two channels. Still the music and sounds do mesh well and don't get too repetitive. For an early game they did try and make it sound as playful as it looked, including a short tune before the level starts when if shows you where you are on the world map. For a platform game these controls are easy to control. The game doesn't make you do anything too insane or needless and the vehicles you get to use don't take rocket science to use. You aren't franticly trying to get items or avoiding impossible monsters. A Novice can play this game easy well still having challenge to a seasoned pro. The fact you can do so much in this game keeps you wanting to play it again and again. 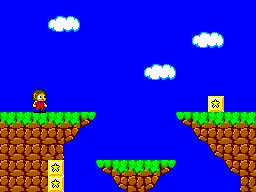 You'll also start to wish there was another good Alex Kidd game like this one. Being as it is on the top of the 100 list should say a lot about the entertaining value of this game. Nothing like a game with a monkey smashing things with his fists! 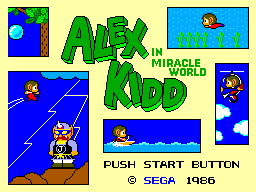 It's a real shame the other Mr. Kidd games never had the game strength as this game did. It was a classic then and it's a classic now. This is one of those games you show the next generation where great games came from! And, Sometimes, it's better not to try and make a sequel to a great game.